Psychic trauma; Social aspects; United States. Souvenirs (Keepsakes); Social aspects; United States. In Tourists of History, the cultural critic Marita Sturken argues that over the past two decades, Americans have responded to national trauma through consumerism, kitsch sentiment, and tourist practices in ways that reveal a tenacious investment in the idea of Americaâs innocence. 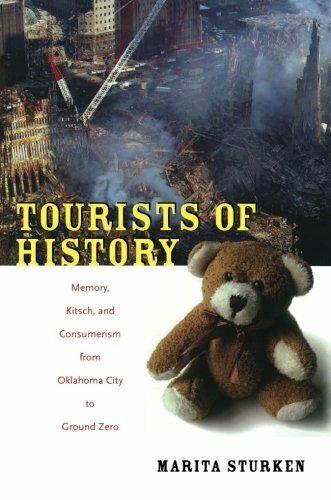 Sturken investigates the consumerism that followed from the September 11th attacks; the contentious, ongoing debates about memorials and celebrity-architect designed buildings at Ground Zero; and two outcomes of the bombing of the Alfred P. Murrah Federal Building in Oklahoma City: the Oklahoma City National Memorial and the execution of Timothy McVeigh. Sturken contends that a consumer culture of comfort objects such as World Trade Center snow globes, FDNY teddy bears, and Oklahoma City Memorial t-shirts and branded water, as well as reenactments of traumatic events in memorial and architectural designs, enables a national tendency to see U.S. culture as distant from both history and world politics. A kitsch comfort culture contributes to a âtouristâ relationship to history: Americans can feel good about visiting and buying souvenirs at sites of national mourning without having to engage with the economic, social, and political causes of the violent events. While arguing for the importance of remembering tragic losses of life, Sturken is urging attention to a dangerous confluenceâof memory, tourism, consumerism, paranoia, security, and kitschâthat promulgates fear to sell safety, offers prepackaged emotion at the expense of critical thought, contains alternative politics, and facilitates public acquiescence in the federal governmentâs repressive measures at home and its aggressive political and military policies abroad. About: In Tourists of History, the cultural critic Marita Sturken argues that over the past two decades, Americans have responded to national trauma through consumerism, kitsch sentiment, and tourist practices in ways that reveal a tenacious investment in the idea of America’s innocence.